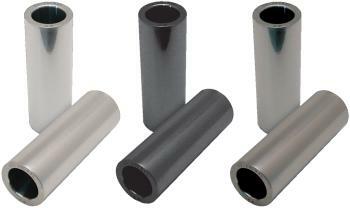 CP Pistons 5100 Series Pins are an affordable alternative Wrist Pin. These high quality Pins are ISO 9000 and QS 9000 certified and statistical process control (SPC) is fully implemented throughout manufacturing. CP Diamond-Like coated Premium Pins are manufactured from high quality 9310 steel. Our metal-free carbon coating is harder than steel, ensuring a durability unsurpassed by any other coated pin on the market today. They are ISO 9000 and QS 9000 certified, insuring consistency, quality and performance. They offer high resistance to abrasive wear, extend the service life and improve reliability under extreme conditions that push other coatings to their limits. When performance and durability are required, these pins offer that competitive edge you are looking for. CP Pistons’ Micro-Dimpled finish pins offer affordable wear protection. This unique treatment process refines and compacts the pin’s surface texture, making it harder and more durable. The improved surface texture allows more consistent lubrication, reducing friction and decreasing chances of wrist pin galling. Available in both our 5100 Chromoly and 9310 pins, these pins are perfect for every budget -and application.